Sunday we went to a dinner party, and everyone sat outside. Yes, outside. Even in the shade you didn’t need woolens and a hat with earflaps. Around seven the temperature dropped 15 degrees in the space of 90 seconds. Sunday morning it was cool, and the Memorial Day cookout at the Crazy Uke’s house was spent shivering outside with plates on our laps, huddled over the meal. You’re surprised to learn that it’s harder to eat when your teeth are chattering. You’d think it would be easier, but it’s a question of timing, and swallowing is more difficult. We have no great love for this place at this time. On Saturday something happened that sums up the boon of America, and the unique problems we face. 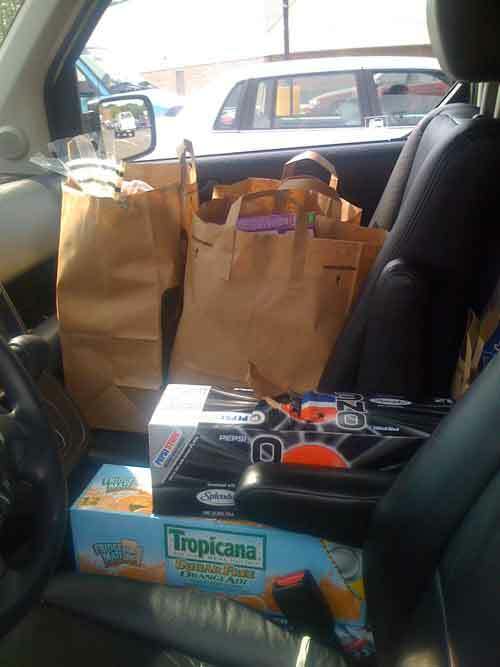 I had purchased so many things I could not fit anything else in the vehicle. Well, I could have put a few more items in, but they would have blocked my view. And hastened the point at which I should slit my throat, too. 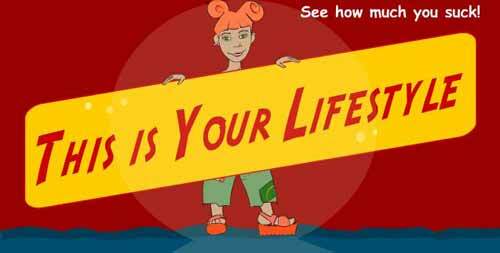 According to this site, put up by the Australian Broadcast Company for this teen show, I should die. In fact I should have died when I was three. These people have lost their minds. Find out when you should die! That's right: should. You have harmed the earth by going to Disneyworld. and the penality for soiling the high holy firmament shall be death. But don't worry; your remains will be used as fertilizer. Not visible in the picture of the car: three more bags of groceries for the contrary antisocial purpose of assisting our continued respiration and hence ecological despoilation, six boxes of microwave popcorn which require energy to make, instead of standing around with some kernals in a pan waiting for lightning to knock over a tree and set it on fire, and a "Green" 1 TB drive. (It will replace a 500GB Western Digital MyBook that died on Friday. Click, click, click, directory-erasing aneurism, then nothing. Dead. No data-recovery tool in the arsenal could help.) Also not visible: Philips Organic Vodka, because I didn’t buy any. Saw it at the Package Store, though, and had to laugh. Organic Vodka. No more pesticide hangovers! Well, find a niche and fool it, I guess. But I probably would have been allowed to live until the age of four and a half if I’d made a point of buying organic vodka. 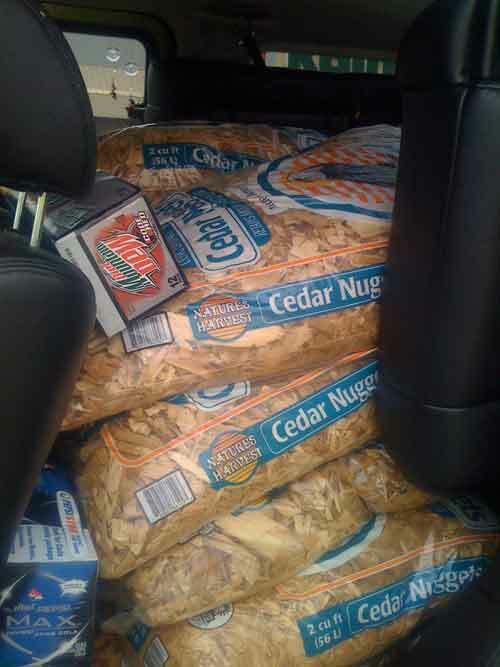 Yes, the dreaded cedar chip errand. 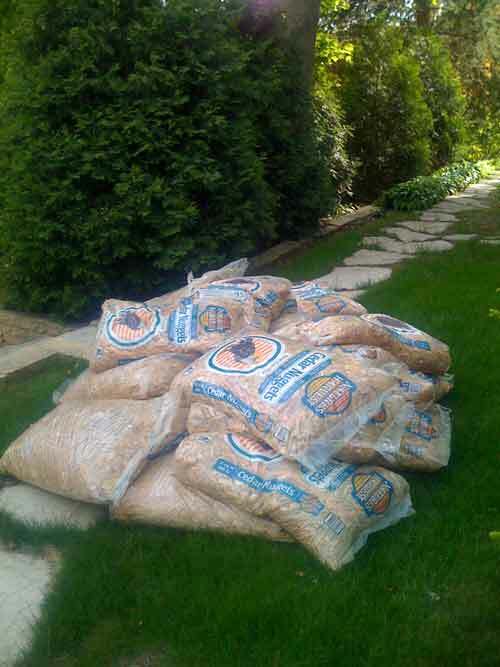 It takes about 40 bags to cover Jasperwood’s various garden areas, including the ignored auxiliary garden area at the bottom of the hill. I can fit ten bags on a pallet. The Element can take 20 bags per trip. So I buy ten bags, put them in the vehicle, push the cart back to the store, and buy ten more. Once home I take them out and throw them on the boulevard, then drag them up the stairs two at a time. It’s hot dusty work, and that’s before I even dump the things out on top of the old chips, which have lost their hue and cedaresque aroma. Before I got them out, though, I had to put away the groceries. 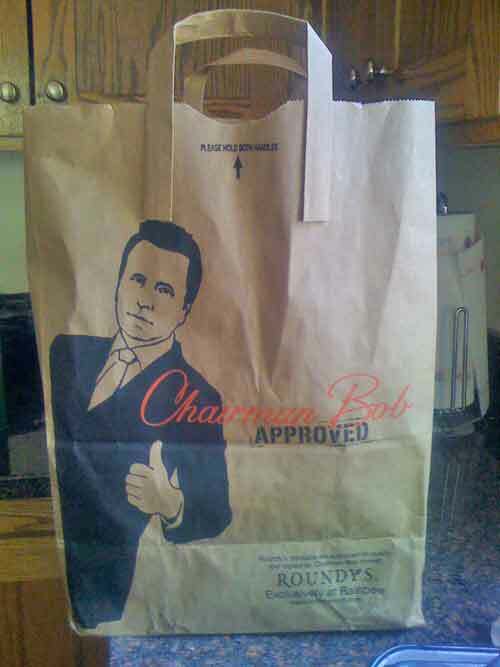 Which leads me to Chairman Bob. Does Chairman Bob approve of insufficiently glued handles? I’d like to know. 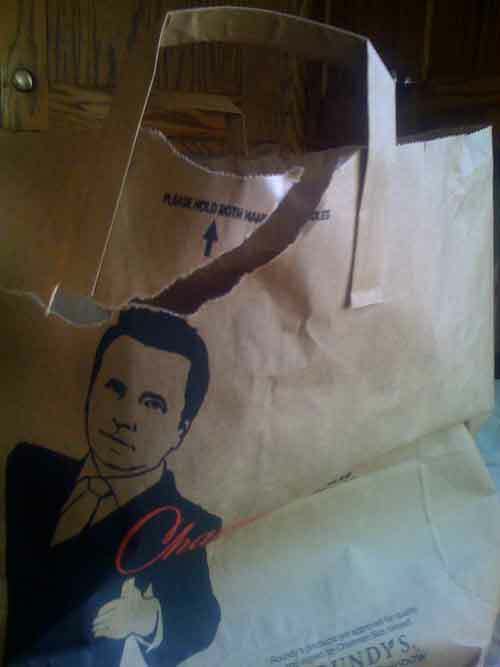 The handled bag is a marvelous attribute of modern life, and the absence of such conveniences was the reason I didn’t hit Cub or Rainbow, which occupy the People’s Starch and Carb Restocking Centers around here. I gave up on Lunds and Byerly’s a while ago, for reasons that would probably make their managers weep: the prices were nosebleedy, yes, but there were two items I go through every fortnight, and they didn’t have them, so gradually I shifted my business to the places that could be counted upon to carry the items. And there’s something else: leaving Lunds required a left turn out of the lot against constant traffic. Rainbow grocery has its negatives – it feels dumpy and the staff is angry with you most of the time – but I can make a right turn out of the lot. On such things personal shopping habits turn. Maybe I’ve just gotten to that point in life where I don’t need my class identity reinforced by the conspicuous selection of free cheese samples. 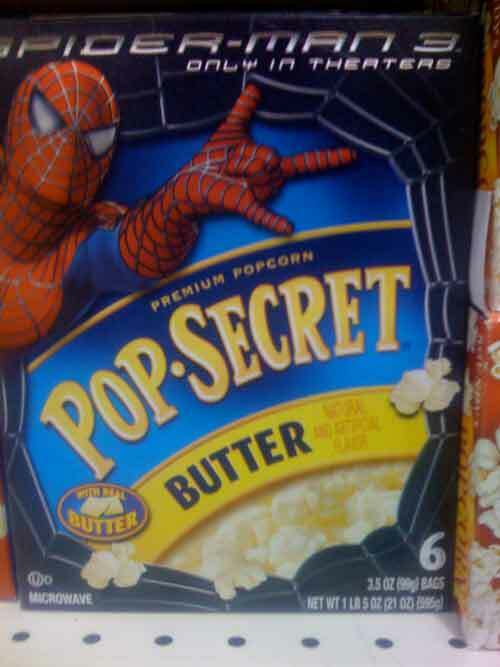 I’m wondering if this is the freshest popcorn around, and I’m thinking no. Anyway. When one of my bags was dumped in the cart, it ripped. I asked if I could have another – I’d rebag it, but it was ripped. I didn’t say anything, because I hadn’t expected that a request for a replacement bag would be met with NO. “I don’t have any more bags,” she said. Oh. 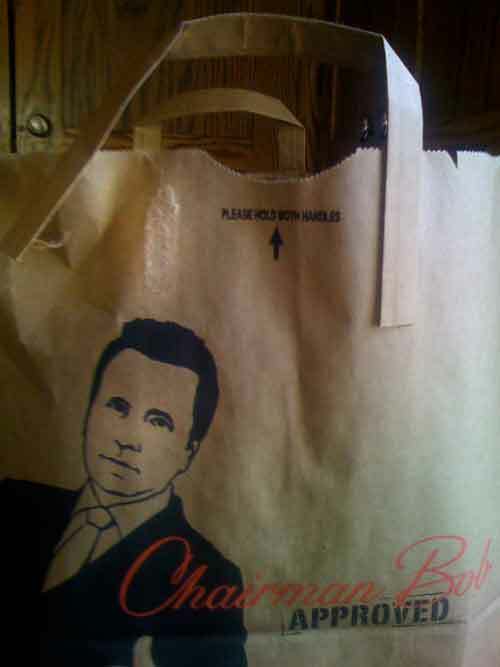 As I left I examined all the check out lanes, and sure enough: no bags with handles. This never happens at Lunds or Byerlys or Kowalskis. If anyone fails to order sufficient handled bags – or, more likely, doesn’t move them from the store room to the front – there would be a barked dressing-down and censorious marks made in the employee’s file. Also possibly floggings. But at Rainbow, you can’t have another bag, and don’t come waltzing in with your sense of entitlement and ask for a free bag to replace the one they ripped because they packed it poorly. Substandard handle adhesive and thin stock that rips easily. If you approve of this, I can only guess what’s in the private label stuff. New Matchbook and Comics up; see you at buzz.mn!